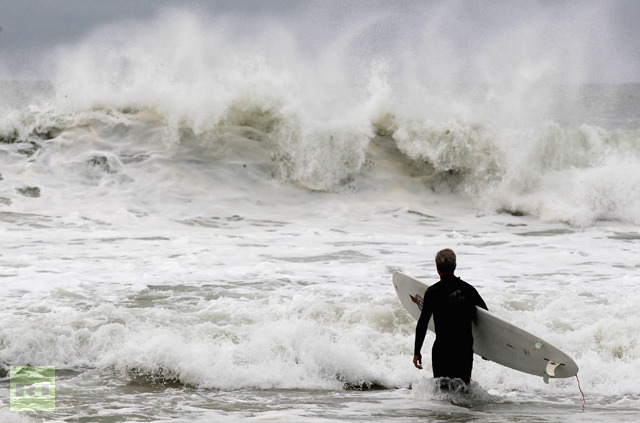 The ‘Frankenstorm’ Sandy is set to be unprecedented in size once it hits the US mainland Monday night. Tens of millions of people could be affected as the hybrid hurricane wreaks havoc from the East Coast to the Great Lakes on Halloween week. ­Increasingly dire warnings of powerful winds, power outages, widespread flooding, torrential downpours and even snow are being sounded in New York and other major population centers as Hurricane Sandy continues its trek up from the Caribbean. President Obama signed an emergency declaration for the states of New York and Massachusetts on Sunday evening. 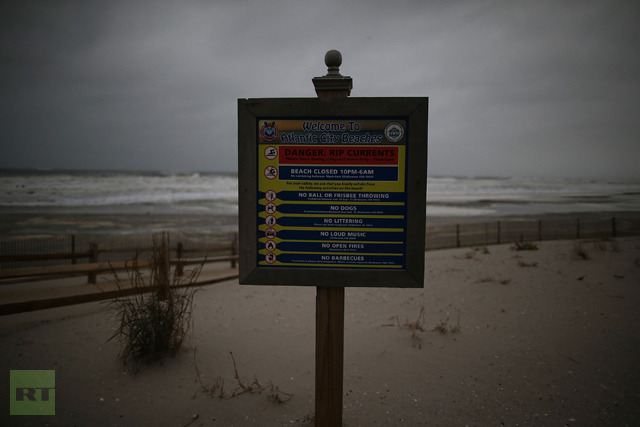 Forecasters said Sandy is set to transform into “super storm,” as the tropical storm merges with a winter storm and a cold front, threatening up to 12 inches of rainfall in some areas and heavy snow inland. “We’re looking at impact of greater than 50 to 60 million people,” says Louis Uccellini, head of environmental prediction for the National Oceanic and Atmospheric Administration. 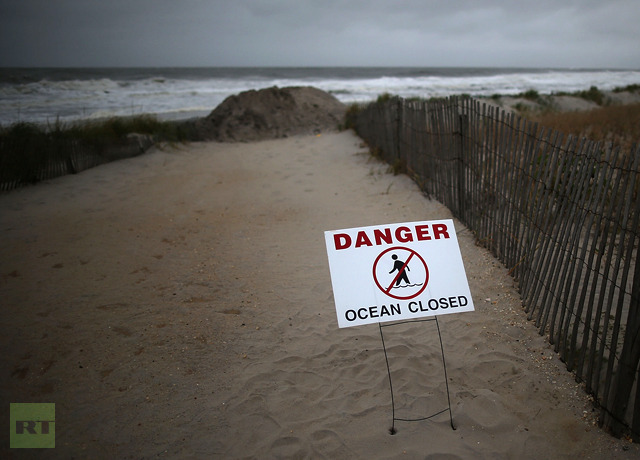 Set to approach the coasts of the mid-Atlantic states by Monday, Sandy is likely to make landfall in the New York metropolitan area, home to about 22 million people, on Monday night. The Category 1 storm’s sustained winds of 75 mile per hour are nothing extraordinary, but with hurricane force winds reaching out 105 miles from its center and weaker tropical storm-force winds extending 700 miles, forecasters are on edge about its potential impact. The powerful gusts are expected to stretch as far inland as Pennsylvania. “These winds are just amazing in terms of their high speed. I cannot recall ever seeing model forecasts of such an expansive areal wind field with values so high for so long a time. We are breaking new ground here,” a National Weather Service meteorologist in the agency’s Washington, DC/Baltimore office said on Saturday night. 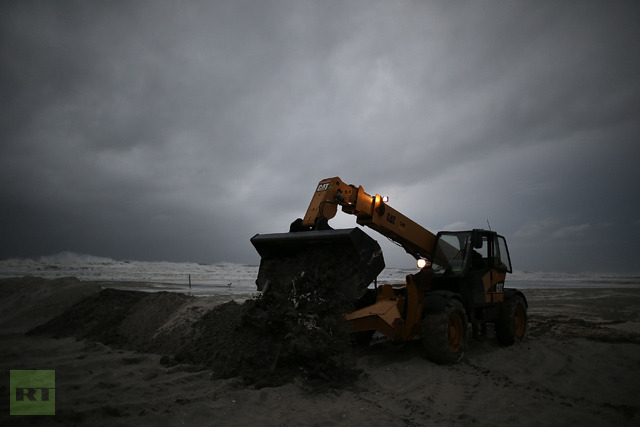 “The size of this [Sandy] alone, affecting a heavily populated area, is going to be history making,” said Jeff Masters, a hurricane specialist who writes a blog for Weather Underground. Those far away from costal areas still have cause for alarm, as forecasters predict that inland flooding from the storm surge could pose a much greater risk than the winds. Utilities officials have also warned that rain-saturated grounds could send trees plummeting into power lines, leaving residents at home without electricity for days. Officials have urged residents to stock up on food, water and batteries, with grocery stores being swamped in anticipation of the potential power outages. New York City Mayor Michael Bloomberg ordered a mandatory evacuation of Gotham’s low-lying areas, home to some 375,000 people in total. “If you don’t evacuate, you are not only endangering your life, you are also endangering the lives of the first responders who are going in to rescue you,” Bloomberg said at a news conference Sunday. The city’s school system will also be closed on Monday, the mayor continued. New York’s Metropolitan Transportation Authority (MTA) had previously noted that New York Governor Andrew Cuomo had directed “an orderly shutdown and suspension of all subway, bus and commuter railroad service” beginning at 7 pm Sunday. Cuomo also said the decision to shut down the state’s bridges and tunnels would be made on a case-by-case basis. The city closed the subways before Hurricane Irene last year, with a Columbia University study predicting that an Irene surge just one foot higher could have shut down lower Manhattan. Bloomberg’s stark warning to residents regarding evacuation might have been spurred by fears that complacency had set in once Hurricane Irene turned out to be far weaker than initially predicted. 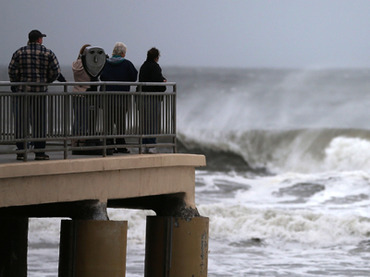 Irene, which struck the eastern US in August 2011, was responsible for 56 deaths and $15.6 billion dollars in damage, making it the fifth costliest storm in the country’s history. “The National Weather service believes there is increasing potential for high winds, coastal flooding and heavy rains across a broad area for a lengthy period of time Sunday through Tuesday,” said Howard Glaser, director of New York State Operations. Next door in New Jersey, hundreds of coastal residents started moving inland after Governor Chris Christie declared a state of emergency on Saturday. 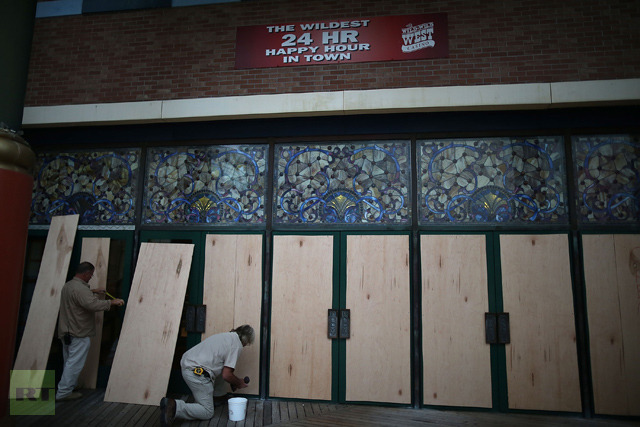 A dozen Atlantic City casinos were closed following the declaration, as the gambling hub is located on a barrier island. The town’s nearly 40,000 residents will be evacuated Sunday, city officials said. As of 8:00 am EST, Hurricane Sandy was located roughly 395 miles south of New York City and is moving over the Atlantic parallel to the coast at a clip of 14 mph. It is expected to make a sharp westerly turn towards the coast on Sunday night. 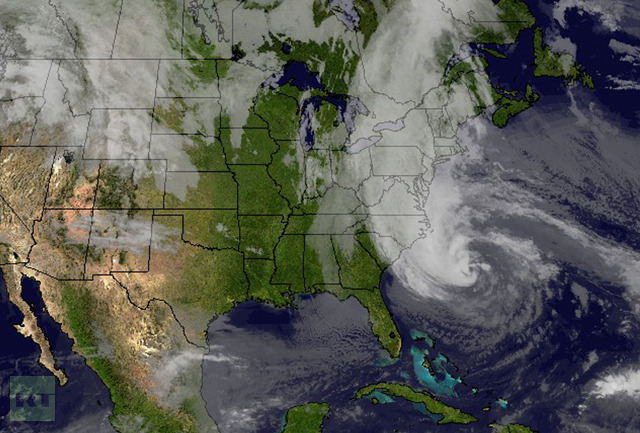 Sandy is expected to transform into “a large and intense post-tropical cyclone as it turns toward the northwest,” Environment Canada said early Sunday morning. “It is possible that this transition could intensify the storm slightly further prior to moving inland somewhere along the New Jersey coast late Monday night or Tuesday morning,” the agency continued. “As many as 23 million Canadians stand to be affected by this storm. That’s 70% of the country,” meteorologist Mark Robinson at The Weather Network warned on Saturday. Sandy has already been felt on the campaign trail, as President Barack Obama was forced to cancel campaign stops in Virginia on Monday and Colorado on Tuesday, while Republican contender Mitt Romney canceled all his scheduled events in Virginia and moved to the crucial swing state of Ohio instead, where he is currently neck and neck with the president. Obama said he was working with state and local officials to make sure they had ample resources to prepare for the potential disaster, which could leave millions of Americans in its wake. The Federal Emergency Management Agency is readying water, meals, blankets and other resources at support bases, the White house announced on Saturday.